… and I just can’t hide it! Just went to the post office to collect a package which they couldn’t deliver yesterday. Opened the box and I found these beauties… not all for me though, I’m sharing these with a few BOTLs. Still, I look forward to trying what should be one of Padron’s best ever cigars and CA’s cigar of the year! 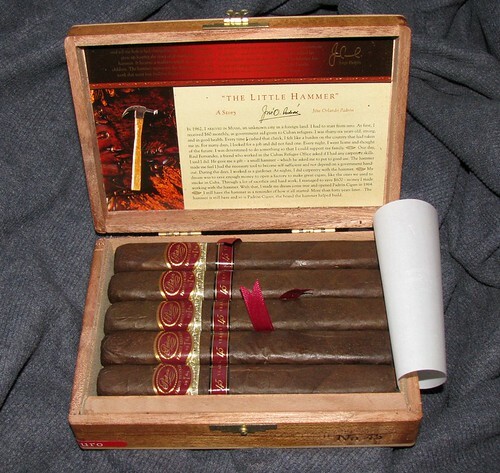 This entry was posted in Just in and tagged Cigar Aficionado, Maduro, Nicaraguan cigars. Bookmark the permalink. I look forward to hearing your opinions on these. Aweek’s time to recover from the “travel” os probably the most I will manage to wait, so review coming up very soon. Fair play to you for organizing this, I’m looking forward to these, to see what the fuss is all about! … a while back when certain discussions where still allowed on UKCF, sorry you missed it! What started out a baby turned into a monster ! And after months of hard work and dedication lets pull the plug on our American brothers. I can understand how you feel about the forum, but, as we have had chance to discuss before, I can see the reason for the decision on the “for sale” part, at least in part consiering the way thingas are in the UK. You might argue that one could have taken a braver attitude, and part of me thinks that too, but we both don’t really know the whole story and neither of us would have had to face the ripercussions if it came to legal proceedings, which makes it easier to say for us. The fact that at the moment there are trades and sales going on right now, but only from UK based BOTLs, seems unfair TBH and I cannot really understand that, but I will ask why that is. I respect your point and I feel the forum has lost quite a bit of interest for me without the lively trade/sale part, but in the end it is the right of those who run the forum to take the decision they believe is right. What we do once that decision is made is a different and personal matter. Now, that’s a great surprise!! it is indeed. Thanks for visiting Tom!